Energy intensity in manufacturing in the United States decreased from 2010 to 2014. U.S. manufacturing overall fuel intensity decreased by 4.4% from 3.016 thousand British thermal units (Btu) per dollar of output in 2010 to 2.882 thousand Btu in 2014. U.S. manufacturing fuel consumption rose 4.7% from 2010 to 2014, although real gross output increased more rapidly at 9.6%. Generally, the most energy-intensive U.S. industries' share of manufacturing gross output declined from 2010 to 2014 (35.1% of total manufacturing to 32%), although they maintained the same share of fuel consumption (80.7%). The group of energy-intensive industries as a whole actually increased in energy intensity by 4.6% as the rest of manufacturing decreased by 8.5%. The shift in output toward less energy-intensive manufacturing contributed to the decline in overall manufacturing energy intensity in the United States. Although many manufacturing establishments are taking steps to reduce their energy consumption per unit of output, the energy-intensity decrease for total U.S. manufacturing is mostly the result of a shift in manufacturing output from more energy-intensive industries to less energy-intensive industries. The energy intensity decrease would have been only 0.72% if the various major industries had maintained the same shares of total gross output from 2010 to 2014. Most notably, U.S. transportation equipment manufacturing, a relatively low energy-intensive industry, grew 30.8% in gross output over that period, exceeding the overall manufacturing increase of 9.6%. The automobile industry is a large part of the transportation industry, and its resurgence in the United States is well-documented. Although manufacturing output and fuel consumption rose between 2010 and 2014, U.S. manufacturing employment decreased over that period, yielding an increase in labor productivity (Figure 1). Manufacturing processes continue to evolve, incorporating more electronic and robotic devices each year, which may be a direct factor in increased labor productivity . However, at the time the 2014 MECS was conducted, the share of electricity consumption compared with other fuels had not risen substantially (Figure 2). Natural gas use is increasing in manufacturing in the United States. As reported in the MECS preliminary estimates, natural gas used in manufacturing between 2010 and 2014 increased its share of total energy, a measure that includes both fuel and nonfuel use. 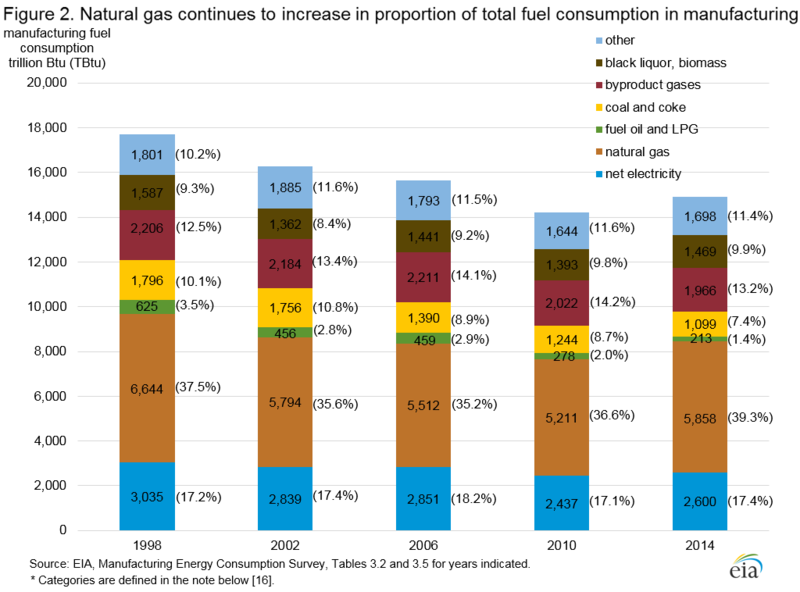 Considering fuel use only, natural gas increased its share of U.S. manufacturing energy use, as coal and coke, and fuel oil and LPG decreased their shares (Figure 2). On a Btu basis, natural gas has been narrowing the gap with coal in the United States and has become much less costly than fuel oil or LPG. [12 ]  In addition, natural gas boilers emit fewer environmental pollutants per Btu than those that use coal and other common fossil fuels. As such, manufacturers may be able to avoid the expenses associated with pollutant mitigation and follow-up as required by regulations such as the Environmental Protection Agency's boiler Maximum Achievable Control Technology (MACT) standards. Natural gas combustion is not subject to the same restrictions under boiler MACT that apply to coal, oil-based fuels, and biomass. Four major U.S. industries accounted for 93% of the coal used as fuel in manufacturing in 2010: nonmetallic minerals, paper, chemicals, and food. Except for chemicals, those industries showed reduced shares of coal and increased shares of natural gas between 2010 and 2014 (Table 1). Although some characteristics of energy consumption in U.S. manufacturing have changed rapidly, other characteristics have remained relatively stable. Total consumption of electricity has varied somewhat from 1998 to 2014 (Figure 3). However, the ratio of receipts of electricity, which include both open-market purchases and within-company transfers, to onsite generation adjusted for sales offsite, has changed only slightly since 1998. In 2014, purchases and transfers combined are 88.4% of total U.S. electricity consumption, and generation minus sales is 11.6%. Those shares have not varied by more than 1% from 1998 to 2014 as measured by the MECS. In 2014, approximately 96% of the electricity generated onsite was from combined heat and power (CHP), which is roughly the same proportion as in 2006 and 2010. The MECS data identify a subset of the fuels used in CHP processes. Of the fuels identified, natural gas and coal are the predominant sources. Generation from noncombustible renewable energy (solar, wind, and hydropower) remains a very small part of the total amount of electricity generated onsite in U.S. manufacturing at about 1%. CHP in the manufacturing sector has grown very slowly since 2000 because of barriers to adoption, including competition for capital, uncertainty regarding fuel prices, and questions regarding the ability to sell electricity back to the grid. However, EIA’s 2017 Annual Energy Outlook expects CHP to rise through 2050 in the United States at an average rate of 1.5% per year, close to the expected rise of manufacturing shipments (2.0% per year). New manufacturing energy sources collected for the first time in 2014 MECS. The data discussed above are drawn from the more detailed results of EIA's 2014 MECS. The 2014 MECS is EIA's ninth survey of the manufacturing sector’s use of energy and covers the United States and four Census regions (Northeast, Midwest, South, and West). EIA plans to conduct future MECS surveys every four years. Data collection for the 2018 MECS will begin in 2019. Beginning with the 2014 survey year, MECS collected consumption of naphtha and other similar oil products directly from the chemical manufacturers, which are its primary users. Similarly, MECS collected consumption of bitumen directly from asphalt producers, which are its primary users. Previously, petroleum-based nonfuel products were included in the petroleum refinery sector to represent the crude oil and other inputs that produced them. Starting with the 2014 MECS, consumption of all refinery nonfuel products, whether directly collected by MECS or not, are excluded from the refinery sector. For that reason, data users must be careful when comparing the 2014 MECS results with previous MECS data on total energy use or energy used for nonfuel purposes. This caution is especially true for the petroleum refinery, asphalt, and chemical industries. 1. 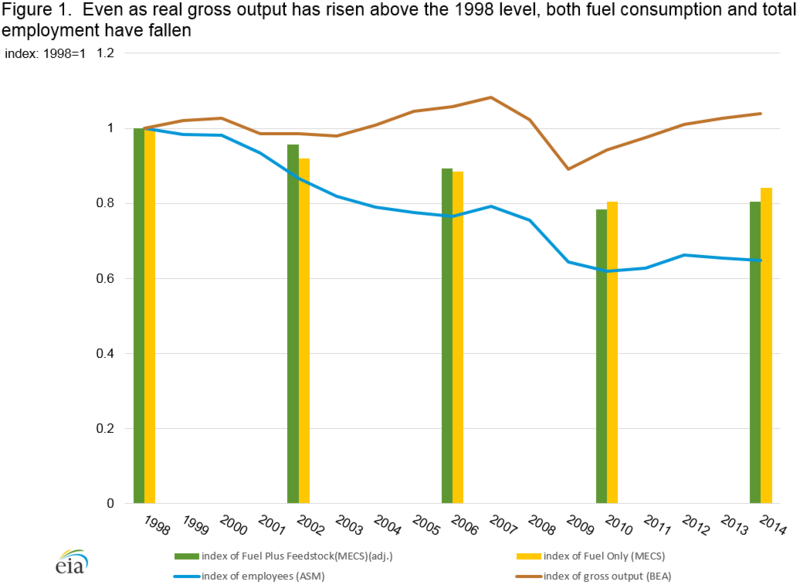 Fuel intensity is defined as thousand Btu of manufacturing fuel use (U.S. Energy Information Administration (EIA), Manufacturing Energy Consumption Survey data, https://www.eia.gov/consumption/manufacturing/data/2010/, 2010 and 2014, Table 3.2) divided by dollars of real gross output (Bureau of Economic Analysis (BEA), Gross-Domestic-Product-(GDP)-by-Industry Data, Gross Output 1947-2016, https://www.bea.gov/industry/gdpbyind_data.htm). Fuel consumption and intensity do not include feedstock use of energy sources (e.g., natural gas to make fertilizer). 2. A quantity indicating the market value of the goods and services produced by an industry. Bureau of Economic Analysis, What is Gross Output, https://www.bea.gov/faq/index.cfm?faq_id=183. 3. Energy-intensive industries include Paper Manufacturing (NAICS 322), Petroleum and Coal Products Manufacturing (NAICS 324), Chemical Manufacturing (NAICS 325), Primary Metal Manufacturing (NAICS 331), Nonmetallic Mineral Products Manufacturing (NAICS 327), and Wood Products Manufacturing (NAICS 321). 4. Data on participation in energy management activities in 2014 will be released in December 2017. Data for 2010 can be found at EIA, Manufacturing Energy Consumption Survey data, https://www.eia.gov/consumption/manufacturing/data/2010/xls/Table8_1.xls and https://www.eia.gov/consumption/manufacturing/data/2010/xls/Table8_4.xls. 5. EIA calculation based on weighting the 2014 intensities by the 2010 proportion of industry to total manufacturing gross output. 6. Gross output value for transportation equipment in real dollars (base 2009): 2010: $665,663 million and in 2014, $870,954 million. For total manufacturing, total gross output in 2010 was $4,717,507 million; in 2014, it was $5,170,696 million. Source: BEA, op cit., footnote 1. 7. For example, White House, The Resurgence of the American Auto Industry – in Three GIFs, https://obamawhitehouse.archives.gov/blog/2015/01/07/resurgence-american-auto-industry-three-gifs, or Los Angeles Times, Auto industry has soared since 2010, leading economic recovery, http://articles.latimes.com/2014/jan/03/autos/la-fi-hy-auto-industry-has-soared-since-recession-leading-economic-recovery-20140102. 8. U.S. Census Bureau, Annual Survey of Manufactures (ASM), https://www.census.gov/programs-surveys/asm.html, various years. 9. International Federation of Robotics, Executive Summary World Robotics 2016 Industrial Robots, https://ifr.org/img/uploads/Executive_Summary_WR_Industrial_Robots_20161.pdf. 10. Brookings, How Technology is Changing Manufacturing, https://www.brookings.edu/blog/techtank/2016/06/02/how-technology-is-changing-manufacturing/. 11. EIA, Preliminary estimates show that U.S. manufacturing energy consumption increased between 2010 and 2014, https://www.eia.gov/consumption/manufacturing/reports/2014/pre_estimates/. Table 1.5 in the current release of the 2014 MECS data represents the update from the preliminary estimates. The consumption of energy for all manufacturing purposes (fuel plus feedstock) changed from 19,045 trillion Btu as the preliminary estimate to 18,280 trillion Btu in the final estimate. 12. LPG or Liquefied Petroleum Gases include propane, butane, ethane, butylene, ethylene, and propylene. This definition of LPG may differ from definitions in other EIA data sources, which often exclude ethane. For fuel consumption only, the topic under consideration above, the predominant LPG is propane. 15. Boiler MACT (Maximum Achievable Control Technology) regulates hazardous pollutants in commercial, industrial, and institutional boilers. EIA, Annual Energy Outlook 2013, Legislation and Regulations https://www.eia.gov/outlooks/archive/aeo13/legs_regs_all.cfm#staterene . 16. Net electricity and natural gas are found directly in Table 3.2 for all years. “Fuel Oil and LPG” is the summation of the Table 3.2 values for residual fuel oil, distillate fuel oil, and LPG. “Coal and Coke” is the summation of coal and coal coke in Table 3.2. “Byproduct gases” is the summation of byproduct gases and blast furnace and coke oven gas in table 3.5. “Black liquor, biomass” is the summation of the values for black liquor and wood waste in Table 3.5. “Other” is the result of subtracting the sum of all the fuel categories listed from the total for manufacturing fuel use. Other includes waste oils and tars, net steam, and various uncommon energy sources that could not be listed separately. 17. 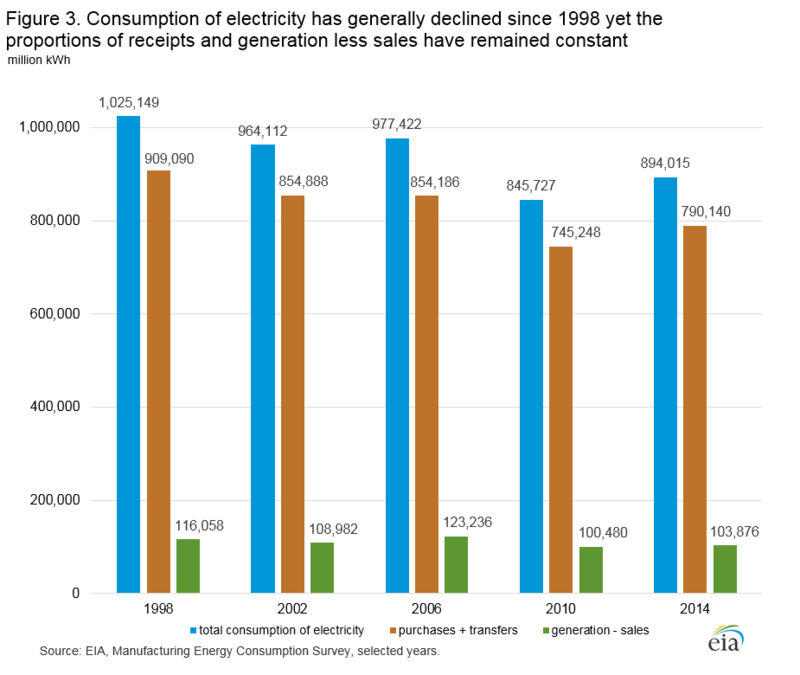 EIA, 2010 MECS, Table 5.2, https://www.eia.gov/consumption/manufacturing/data/2010/xls/Table5_2.xls. 18. Utility Dive, Combined heat & power: The grid's 'best kept secret?’, http://www.utilitydive.com/news/combined-heat-power-the-grids-best-kept-secret/420484/.